Over the last few weeks and months, VISA, the credit card company, has been making plans to turn the iPhone into a credit card. By using just an iPhone, users could pay for their transactions at retailers without ever having to touch their VISA card. Two weeks ago, VISA announced that they had partners with DeviceFidelity, a company that has assisted VISA in building an iPhone case to allow the iPhone to act like a credit card and make payments. In 2009, DeviceFidelity inserted a near-field communications chip into a microSD card to enable credit card transactions. Once the microSD was put into a mobile device, the device became a contactless credit card. The issue at the time was that the iPhone did not, and still does not, support microSD. So they created a case instead. 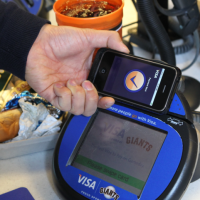 The iPhone, together with the case called “In2Pay”, would be used at any retailer that has the contactless VISA payment terminal. Users would simply move their iPhone close to the terminal and pay for the transaction. The case looks like a battery pack case that connects the iPhone into the dock connector and covers the iPhone from back to side, leaving the screen exposed. The dock connector provides the SD card interface and the battery power to enable the credit card features. Once the case is on, users insert the microSD card, download the payment app from the App Store and the iPhone effectively becomes a credit card. At this time, Canada is not a supported country but once the technology gains a bit more ground, you can be sure that VISA will be moving this not only into Canada, but worldwide.